My mother couldn't be happier at Vista Del Lago! She loves the food, the friends, and all the wonderful people who work there. There is always something to do for every level of memory. :) She is exactly where she needs to be at this point in her life and we couldn't be happier with the help, care, and love she gets living there! When we visit we sit out on the patio and she points out all her birdies, beautiful plants, and tells us how lucky she is. Vista Del Lago is outstanding, very nice, and clean. They had a group that brought in a bunch of animals for people to hold and pet. They had a large dining room. The marketing director took a lot of time to answer my questions, and she seemed to want to make sure I was understanding what I was looking at. She didn't want to sugarcoat anything, and I felt very good about the place. I was more impressed with them than all the other places I visited. The staff appeared to be very attentive to the residents and I didn't see anybody who looked like they needed some kind of help which they weren't getting. All the residents I saw were happy and content. Vista Del Lago’s director is very caring and involved with everyone. Every time we went over to visit the facility, my aunt is visible and interacting with both the residents and the employees, and she is very involved in the care of the residents. In addition, the people in the facility also appeared to be very caring. It looked clean, and it was a memory care facility, so it was very conducive to the needs that we were seeking. And price was also a consideration. One of the reasons we chose that was because it’s brand new and half of it was closed. Even though we’re paying for a double room, our senior parent is alone in a room right now, they said they would keep her alone as they could, so the room is very spacious and for her mental status for now, I don’t think that it would be good for her to have a roommate. They are doing a really good job. Below are one of many beautiful memories created since my beautiful parents moved to Vista Del Lago. "I am grateful for the random time I arrived at VDL yesterday because I got to witness magnificent magic in the activities room. First let me describe my travels that got me to the my final destination "where the magic" was really happening. ;) After entering the VDL community hallway, I beelined straight to my parent's room to pleasantly and surprisingly see two empty beds and no mom or dad in site. Then I beelined (after a brief rant to Maria) to the common living room area to find what felt like a ghost town. Then I heard "life with a capital L" coming out of the activities room. I immediately beelined to the activities room to see the musical magic and therapy occurring at VDL in what Val termed in the Sage App as "Happy Hour with Music Station". As I entered this majestic land, my first thought was to locate my parents - ok I see them! Then I ducked, hid, and beelined straight to Karen and asked her how her dad was doing. The magic in the room was so powerful that Karen started coughing and couldn't respond to my question so instinctively I opened my "unopened" bottle of water and asked her to take it then I beelined straight to my parents. I sneaked up on my mom and surprised her with my "hopefully not too scary" mug and hugged and kissed her then hugged and kissed my dad. Then holy cow - the sites I got to see first hand were absolutely amazing! - I saw Ms. V dancing with Val and Ms. V had a grin (as wide as Cheshire the Cat from Alice in Wonderland) on her beautiful face. Ms. V was truly enjoying herself. She got some moves :). - I saw Mr. B's wife Ms. C twisting and shaking her body to the song "Tequila". Ms. C felt the powerful magic as Karen did to the point of almost tipping over. :D. She's a lively one! ? - I saw my parents singing with passion songs they probably haven't sang in over 15 yrs. My mom was belting out the words as loud as she could and my dad was wheelchair dancing back and fourth! Priceless! - I saw Ms. L, moving like Ms. V and Ms. C and dancing her dementia away; if only for one hour! When the music and singing stopped my first thought was "Wow! I think I need a cigarette after that..." Kidding! Seriously, I thought "Wow! This musical group (of two people) had the perfect combo/playlist of songs that each individual resident can relate to, sing to, and enjoy. It's like this musical group knew the VDL crowd's demographics before hand". Truly a magical site to see! As I walked with Ms. L toward the entrance or exit of the VDL hallway (depending which direction your are walking in) I told Ms. L "You got some moves!" Ms. L replied "They were really good and I really enjoyed myself" with her Ms. L grin. :)"
My mom is already in Vista del Lago, and it has been very nice, very comfortable, and very friendly. So far, everything has been very good. They have Bingo and volleyball, painting, manicure, and makeup, so they have a lot of activities. There is a spa, some kind of large gathering room, which is really nice, and then also the dining facility. Her room is just a bed and bath. Thank you very much for reviewing our facility. It is our pleasure to take care of your mom. My parents are in Vista del Lago right now, and the only way that I would move them is if I could find a place that was just as nice for a lower price because I’m spending a lot of money a month on both of their care. They are in a facility that’s far away from me, and I need to have them closer. I like that they’re new and that every time I call them, they’d call me back and I can get hold of people. I like that their nurses call me at night for any reason like my parents are maybe uncomfortable or have any kind of an issue. I like that I’m personable with everybody there and they’re personable with me, and I like the fact that they are really close to my dad because he’s a handful and they’re keeping track of him. Vista Del Lago accepted us and gave us $3,000 off the first three month's rent, so that was a nice incentive. They allowed my dad to have his pets, which was a nice incentive as well. They have a 24-hour nurse on staff, and they are decent. There's not too much food, and it's pretty decent. The place is decorative. It doesn't stink and smell like a gloomy nursing home. He has his own furniture in his room. They do a lot of activities, which he finds very nice. They have a nice little program always going on. Vista Del Lago has been very great, and very accommodating. We liked it a lot because it’s strictly geared towards memory care. They don’t have a shower in the room, but they have a spa. They take the people who need more help to the place to get their showers; so, we thought that that was very good. I think they just renovated so it’s all brand-new inside. Vista del Lago is a memory care community that specializes in the needs of seniors. Our compassionate team members provide quality care to our residents that are facing Alzheimer’s disease and other related dementias. At Vista del Lago, our personalized activities, services and amenities enhance quality of life and allow our residents to focus on filling each day with friends and memories. WHAT MAKES VISTA DEL LAGO SO UNIQUE? We are focused to ensure our residents enjoy the best day possible-everyday! Our Vibrant Life program sets new standards of excellence for daily programing, encouraging both the resident and Vibrant Life Director to push conventional boundaries and eliminate the stigmas of traditional senior Living programing. 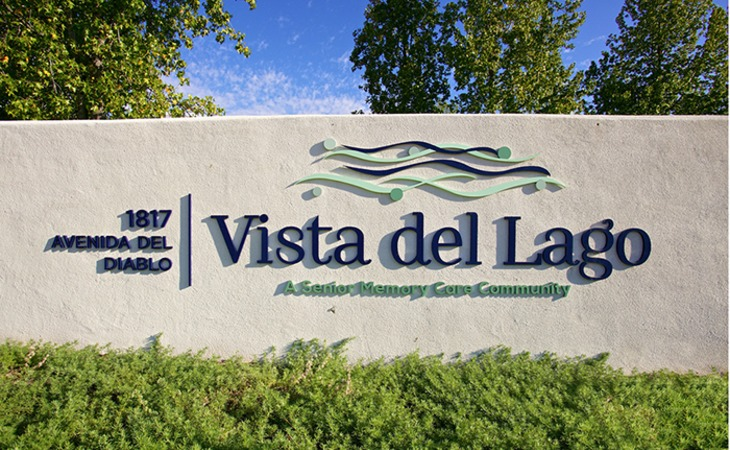 What should caregivers and potential residents know about Vista Del Lago?